One of our big goals for Meatless May was to try to cook new food that we hadn’t ever tried before. Most of this focus was on fish, and so some people have correctly pointed out that our vegetarian month was more of a pescatarian month. We envisioned that May would include more legumes and maybe even tofu, but we fell short on that goal. We still have many more opportunities to give some of those recipes a try and won’t let a meat-ful June thru December stop us from cooking vegetarian as well. 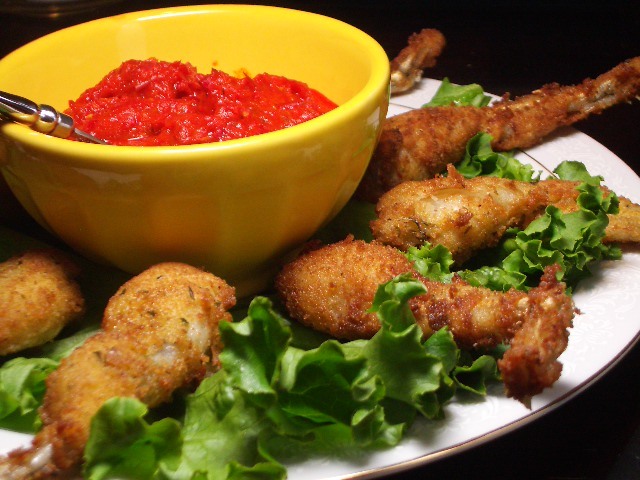 In our pescatarian May, we had fun trying something we’d never cooked before: Frog Legs. There was considerable debate about which category frog legs actually fall into- they have legs, but are they closer to fish or to land animals? Based on taste, texture, and preparation, we decided that (regardless of what a biologist may argue), culinary-wise, they’re closer to fish. Fried golden brown and served with a delicious sauce, it didn’t take much convincing that we were doing the right thing. We highly recommend this recipe for its novelty, beautiful presentation potential, and the unescapable fact that it just tastes good. We’ll definitely check out your blog – but we got the frog legs at Harris Teeter – our local grocery store!! We were surprised to see them there… so good though. they look delicious! wish there were frog legs in Malawi. We do have roasted mouse on a stick if you’d like me to get that recipe! Fascinating post. I blog about a pesetarian diet. Not sure frog legs will ever make the cut. I wonder where you got yours?